Thousand Oaks, CA — December 2016… Mitchell’s totally reimagined line of high-performance electric guitars and basses has been turning heads and making waves, and their FB700 Series is a radical new take on bass that will get the attention of serious bassists everywhere. The FB700 features an offset double-cutaway body made of rich carved mahogany, topped with an eye-catching, precision-sculpted AAA quilt maple veneer for a striking but elegant modern look and feel. The FB700 is fitted with a smooth 5-piece maple/rosewood neck with rosewood fretboard for ultimate playability and comfort. It also features a Graph Tech™ TUSQ XL reduced-friction nut for rock-solid tuning stability. Dual premium MB4 paraffin-dipped alnico V humbucking pickups deliver smooth, well rounded tone and even output while reducing microphonics and feedback, and the active preamp circuitry gives you three bands of wide-ranging tonal control, with a pickup blend control knob for even deeper sound sculpting options. High-tensile strength fretwire, die-cast high-ratio tuning machines, a high-mass adjustable bridge, and sleek black nickel hardware add to the FB700’s premium look and feel, making it the one go-to bass for versatile players in rock, metal, country, jazz, blues, or whatever music you’re playing today. 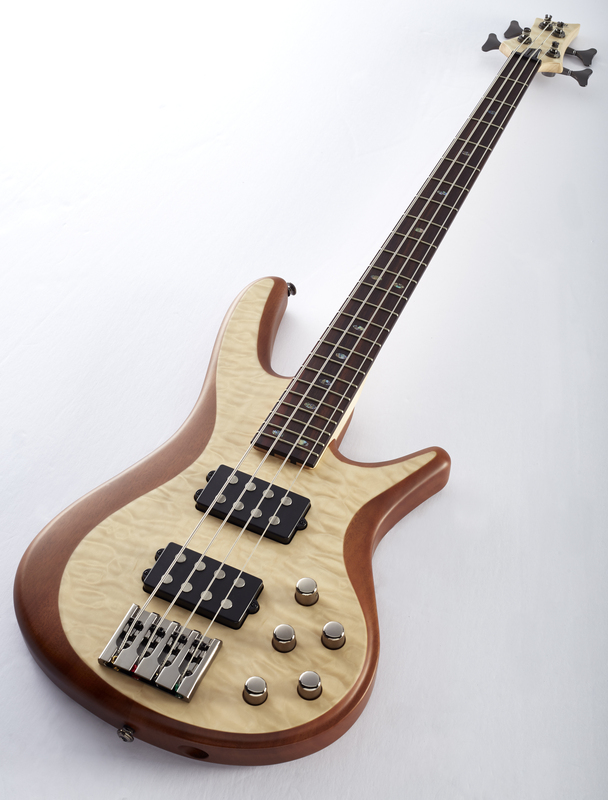 The FB700 is available in Natural or Transparent Black quilted maple finishes, and comes in 4, 5, and 6-string models. U.S. street prices range from $699.99 to $799.99. Check them out, along with the entire line of Mitchell Electrics, at Guitar Center or Musician’s Friend or visit www.mitchellelectricguitars.com for more information. Thousand Oaks, CA—March 2017… With its traditional looks and tone, Mitchell’s new TB500 electric bass is a true rock, blues, and pop workhorse. Bassists will immediately appreciate its traditional-style, custom-contoured alder body; one-piece, 34-inch-scale maple neck; and smooth Indian rosewood fretboard with 20 jumbo frets. High-tensile-strength fretwire provides durability and a smooth playing experience. 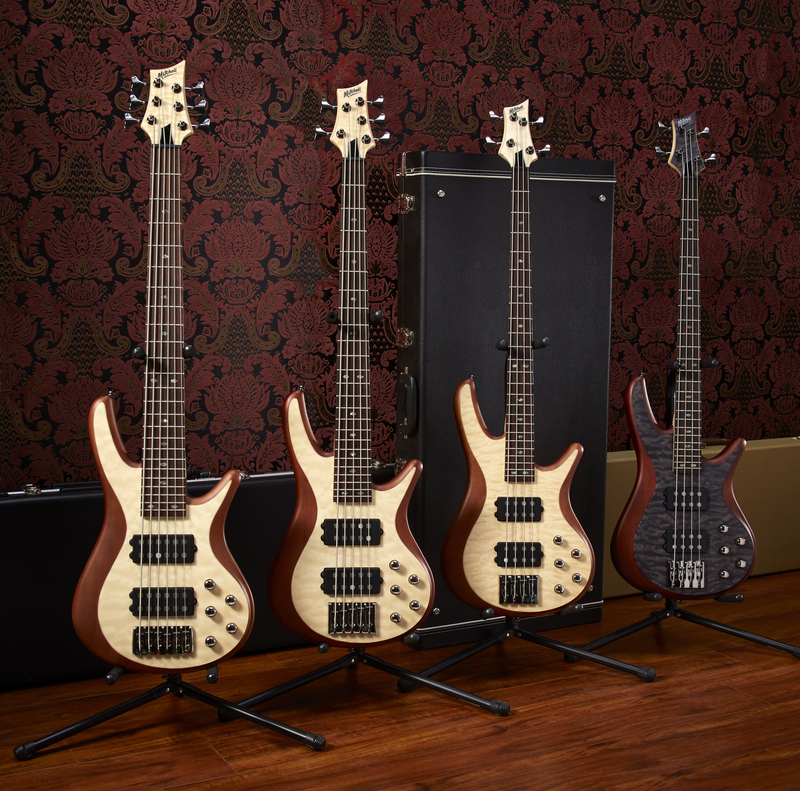 Mitchell's totally reimagined line of high-performance electric guitars and basses has been turning heads and making waves, and their FB700 Series is a radical new take on bass.